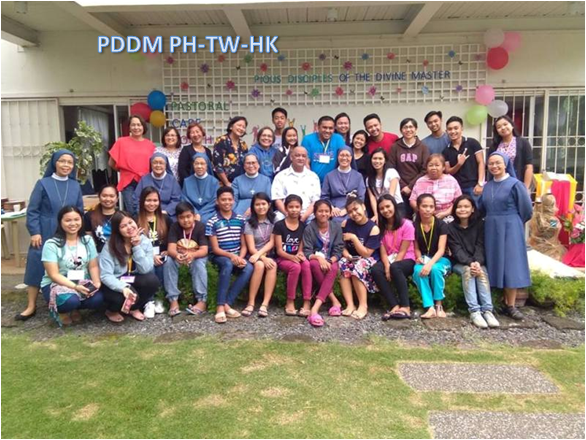 PDDM PH-TW-HK: The Pastoral Care for the Youth and Vocations (PCYV) in collaboration with the Divine Master Community in Davao, the PDDM Lay Mission Collaborators (PLMC) and the Friends of the Divine Master (FDM) held a Vocation Youth Camp within the vicinity of the Divine Master Convent last January 19 to 20, 2019. The registration started at 3:00 o’clock in the afternoon of January 19. The young people who came to join the gathering were welcomed with refreshments prepared by the sisters and the FDM-Davao Unit. It was followed by an orientation facilitated by Sr. M. Janice Golez, the PCYV Directress of the PDDM Philippine-Taiwan-Hong Kong Province. Dinner was served and the participants had fellowship with each other. Then, musicians Bro. Emerson Calumpang, a lay associate Dominican and Fr. Oscar Enjaynes of the Order of Preachers led the youth in a mini concert which spontaneously featured the talents of the participants. Sr. M. Janice also gave a talk on the Year of the Youth with the theme Filipino Youth in Mission: Beloved. Gifted. Empowered. The second-half of the gathering included a solemn Eucharistic Adoration at the community’s chapel and a forum on the celebration of the Pauline Family Vocation Year. Fr. Albert Bernal of the Society of St. Paul gave an introduction about the said Pauline event and shared his own vocation story. Two PDDM sisters, Sr. M. Thelma Cañete and Sr. M. Gracia Mag-uyon also inspired the youth with the unique stories of their call. Afterwards, the participants were allowed to interact by asking them questions. The last part of the gathering was a workshop wherein the participants were divided into groups to make concrete action plans on utilizing the different aspects in youth life: the Word of God, sports, arts, family, prayer and the digital age. The gathering closed with Eucharistic celebration presided by Fr. Albert Bernal, SSP with a rite of mission-sending which was symbolized by the tokens given to the participants.